The RIH Foundation, in partnership with the new RIH Research Department, proudly present a 3 part series focused on health care decisions. A panel of health care specialists and legal experts will discuss planning for future health care decisions. They will explain Medical Orders Scope of Treatment (MOST) and discuss Advanced Care Planning. The palliative journey describes the places where people nearing end of life, family and care partners interact with the formal care system, government legislation, and other support services. Interior Health is working hard to ensure the people within our communities have access to the highest standard of compassionate and respectful care, while ensuring staff and physicians provide services within the law. 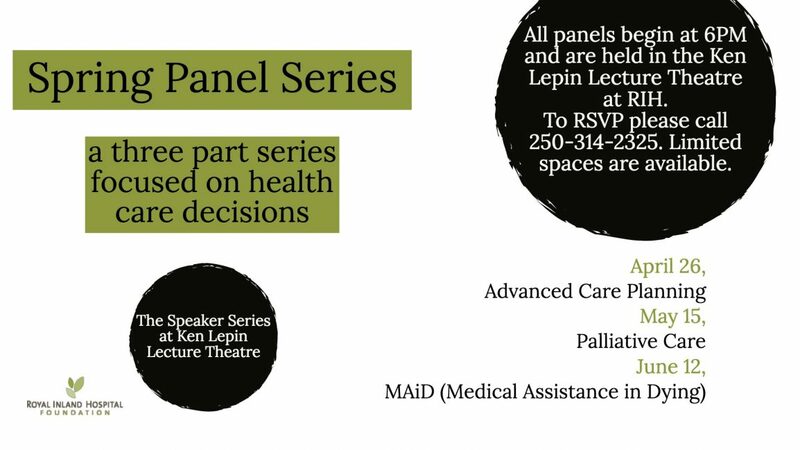 To RSVP for any of the panels please email RIHF@interiorhealth.ca or call 250-314-2325. There is limited seating available for these lectures so please register early to ensure a spot.